You are cordially invited to an intimate dinner party at one of our city’s culinary jewels. You'll enjoy a world-class four course tasting menu complete with wine pairings amongst a gorgeous, inviting atmosphere. This evening is one you won’t want to miss. Here's the fun part: The location won't be disclosed until the morning of. But, trust us—we know our stuff. This special gem has recently been crowned in our “50 Best Restaurants” issue. Intrigued? Stay tuned for more clues along the way. Tickets to The Dinner Party are sold individually. Each ticket includes your multi-course meal, wine pairings, tax, and gratuity. Unique VIP experience tickets can be purchased for our first seating at 5 p.m. All seatings are communal. All tickets are all-inclusive and include your meal, drink pairings, tax, and gratuity. Our VIP experience offers something above and beyond. On the morning of the event you will receive an email announcing the location. When you arrive to the event, check in with the host and enjoy your one-of-a-kind dining experience. WHAT IS THE DINNER PARTY? 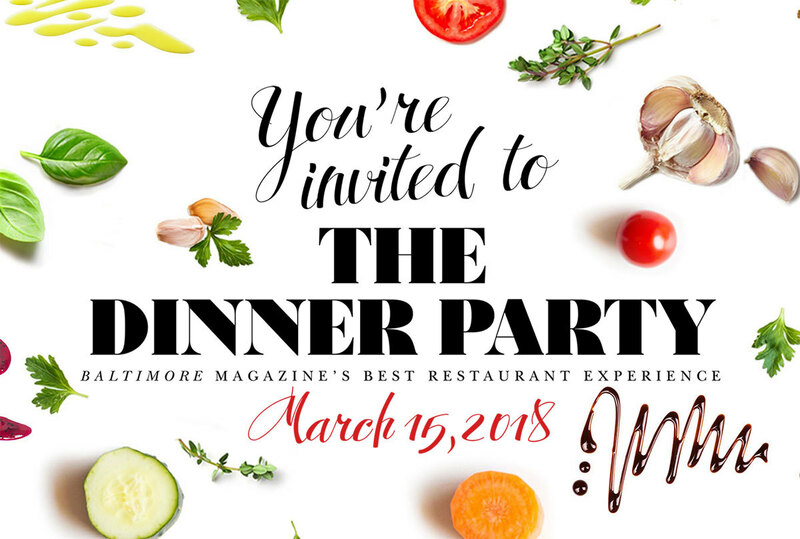 The Dinner Party is an upscale, intimate dining experience brought to you by Baltimore magazine to celebrate our March issue, featuring Baltimore's "50 Best Restaurants." We'll toast throughout the evening to the city's exquisite and evolving culinary scene. Featuring a multi-course tasting menu with wine pairings, fused with elements of mystery and excitement, The Dinner Party creates a true one-of-a-kind dining experience. Simply purchase a ticket to the The Dinner Party at the seating time of your choice and you will receive an email with the undisclosed location the morning of the event. When you arrive to the event, check in with the host, sit back, and enjoy! All seatings will be communal. WHO CAN ATTEND THE DINNER PARTY? Tickets are available to the public, but all diners must be 21 years of age or older. Tickets to The Dinner Party are sold individually. All tickets (regardless of general or VIP) include your multi-course meal, wine pairings, tax, and gratuity. Our VIP experience provides true first-class dining. You'll enjoy an additional welcome beverage, a behind-the-scenes tour of a world class kitchen, a special gift, and early entry to properly savor this unparalleled evening. Unfortunately, all ticket sales are final and we do not offer refunds. DO I NEED TO BRING A CONFIRMATION OR TICKET TO THE EVENT? Yes, please bring your printed tickets or purchase confirmation with you. When you arrive the host will assist with check in. Contact us at least 72 hours prior to the event regarding any dietary concerns, and we will do our best to accommodate. Due to the nature of the event, meal substitutions will not be accommodated on-site without prior notice. Have any further questions we didn't answer? Email us at [email protected].